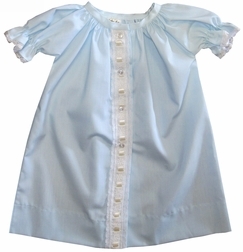 Home > Babies & Infants > Baby Clothing, Gowns & Layettes > INFANT BOYS > Baby Gown Boy's and Girl's in Blue & Ecru by Lullaby Set. Baby Gown Boy's and Girl's in Blue & Ecru by Lullaby Set. This is a wonderful coming home dress/gown for your new little girl OR boy. It can be worn as a day gown after arriving home from the hospital. 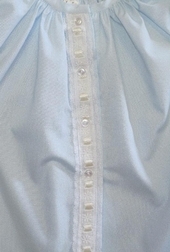 It is made with blue light weight cotton and embellished in the front with woven ecru satin ribbon. 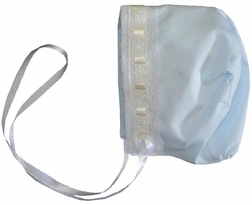 A beautiful matching bonnet is available.